It’s just after 11 p.m. when the bartender tips my bottled beer into a plastic cup and shoves me out the door. I’m startled, and so are my new friends, some other backpackers I met a few days ago on a bus through the Laos countryside. There’s only one major difference. 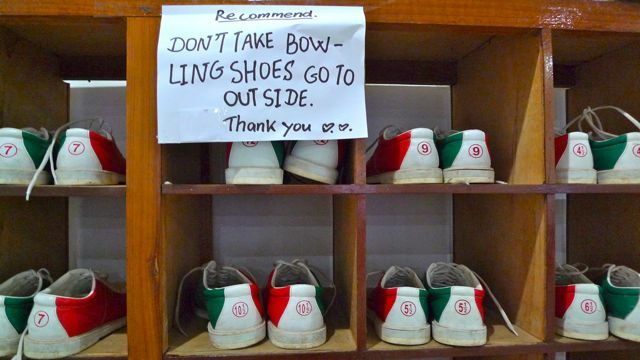 Though the front wall is lined with garish green, white and red bowling shoes -- they’re adorably ugly in Laos too -- everyone has kicked their sandals off, and they’ve taken over the lanes with bare feet. It’s all good fun -- the drinks, the music, the terrible frames peppered with gutter balls. It reminds me of when I was 17 years old, defying all the rules set by adults. My friend Karen and I slipped out of so many slumber parties, hearts pounding, running through the neighborhood in our pajamas, willfully breaking curfew not for any real reason but to stay up late, laughing. Maggie Downs is a writer based in Palm Springs, California. Her work has appeared in the New York Times, the Washington Post, the Los Angeles Times, Roads & Kingdoms, BBC.com and Smithsonian, among other publications. She holds an MFA in creative nonfiction from the University of California Riverside-Palm Desert. Judge's Comment: Laos: a laid-back little country off the beaten track, where barefoot saffron-clad monks gather alms on the banks of the Mekong. But no, here we are drawn into something different, darker: the unknown 'underworld' of breaking curfews in Luang Prabang...ending up in...nothing more sinister than a bowling alley! Great suspense, great humour. Funny! Fun. I felt like I was there. I had just as much fun reading as being there! What a great way to start my work day with a smile! I was slightly holding my breath about the warehouse.....wonderful! Never been to Laos, except through your post. Thank you for this mini-vacation adventure. More, please!! I agree with Tanya, it really felt like I was standing next to you, barefoot and bowling. Great writing!